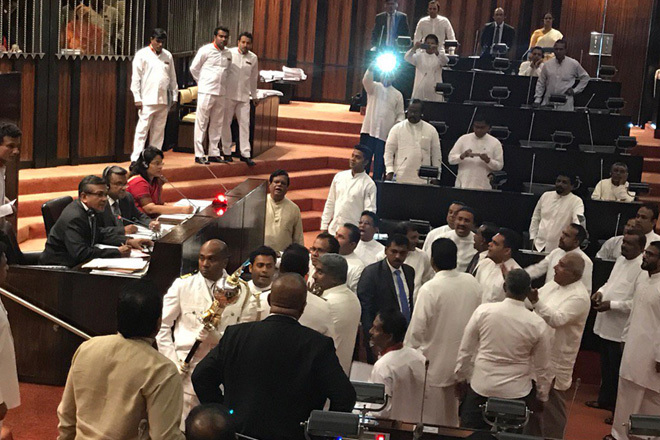 July 28, 2017 (LBO) – Sri Lanka’s Parliament on Friday was adjourned following a tense situation in the chamber with opposition parliamentarians staging a protest. Parliament was adjourned until August 4th when the government was prepared to pass the essential services gazette on petroleum. JVP leader Anura Kumara Dissanayaka, protesting against the vote, said it should be taken after necessary answers provided by the government about the alleged attacks to CPC unions. Releasing a statement later in the day, Speaker’s office said the provisions related to essential services gazette on petroleum have been properly passed in Parliament. The agreement pertaining to the Hambantota Port was to be debated in Parliament after an amended agreement pertaining to the lease of the port received cabinet approval Tuesday. • Hambantota International Port Group (Pvt) Ltd – with a capital of USD 794 million and 15% shares to SLPA and 85% to CMPort as in SAGT terminal and CICT terminal. Accordingly, instead of 80:20 share distribution in the initial agreement, shares of overall investment will be revised as 69.55 to CMPort and 30.45 for SLPA. The land will only be given to two newly established companies on lease basis and their shares are allowed to be purchases by SLPA as follows. • After 70 years of effective date of agreement at a fare rate decided by Government Assessor and an independent assessor. • After 80 years of the effective date SLPA has the right to purchase shares of CMPort and its affiliated companies at a rate of USD 01 as the SLPA’s share holding in HIGP to be 60% and HIPS to be 76.8%. The sole authority of managing the defence of the port is the Sri Lankan government and use of the port for military activities is prohibited.